The architectural firm CRSA designed the landscape along the S-line bike trail in Salt Lake City. Kelly Gillman, a senior principal with the firm, was the lead landscape architect and managing principal on the project. He now uses the S-line to bike to his office. 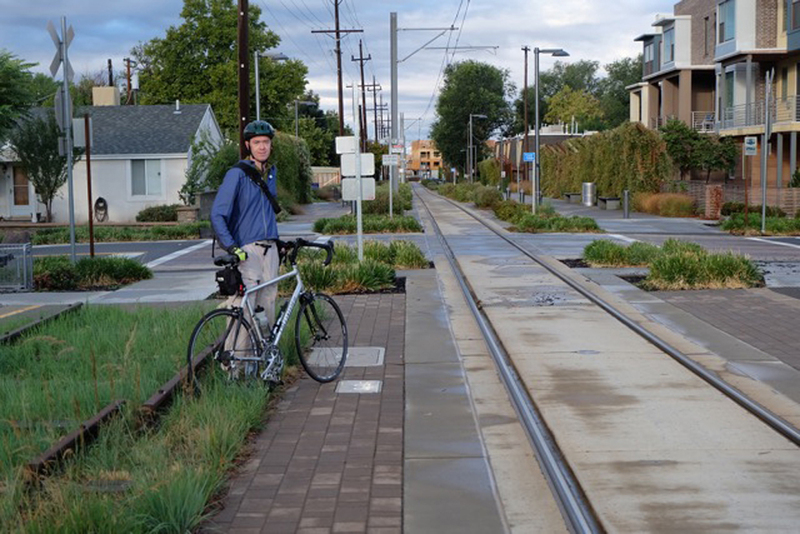 Due to his firm’s diligence and design work, Kelly and his fellow architects were able to avoid UTA’s planned concrete and cyclone fencing for the much more aesthetically pleasing plant based wall separating the bike path and the streetcar. Cycling Utah: Kelly, before we move onto your role in the S-line bike trail landscaping, let’s talk about you, your family, and then your bike and commute. So tell me about you and your family. Kelly Gillman: I am married with two daughters. I am a landscape architect and certified planner, a principal with an architecture and planning firm in Salt Lake City. My wife (Tina) is also a landscape architect, but also a teacher at our daughters’ school. My family is supportive of my bike commute. Although the commute means I may be home a little later than if I drove, they appreciate that I arrive home with a clearer mind. The ride allows me to push the demands of the work day behind me. They also appreciate that I am healthier. C.U. : Do your wife and daughters follow in your cycling footsteps? K.G. : The school Tina teaches at, where our daughters attend is near the Marmalade District downtown. It is too far from our Canyon Rim neighborhood (in the city of Millcreek) to realistically ride to. However, Tina does regularly ride around our neighborhood to get to exercise class, or with other neighbors. A few years ago she designed the bike path system on Wasatch Blvd (when she was with a previous firm). She rides it with a neighbor from time to time. Our daughters haven’t shown much interest in riding, other than to go to Bob’s Brain Freeze. C.U. : Tell me about your commuting bike. I understand it once belonged to your father? K.G. : I first started commuting a couple of years ago on my mountain bike. As I found myself enjoying the ride, I decided to try a road bike. I obtained my first road bike from my Father. He had scaled back his riding and I asked to try it out and now it is my full time bike. It is a Specialized Sequoia. My father used it for longer rides rather than commuting. I am also using it for weekend rides as well as my daily (3 times a week) commute. Because of its age I needed to make a few simple repairs (although not necessarily upgrades) to the bike. I’ve so far primarily added new Shimano wheels and a RoadMorph bike pump. I am considering putting a rack on the bike so I don’t have to carry my clothes in a pack on my back. C.U. : Tire size is a frequent mention in cycling articles and in my experience commuters use a variety of widths. What do you use and has it worked for you? K.G. : I am currently riding with 23MM size tires. I haven’t had any issues with them, but I admit I have very little experience with any other sizes other than what is typical for a mountain bike. I suspect if I extend my commuting into the winter I will appreciate trying some other tire widths to compensate for the greatly varying road conditions. C.U. : What is your route to work? What are the best and worst features of the route? K.G. : From my home on the east side of Canyon Rim, I jump on the Parley’s Trail at Tanner Park and ride through Sugar House to the S-Line Greenway, that we designed at CRSA. (Incidentally, the S-Line Greenway was featured in Landscape Architecture Magazine in November of 2017). At 600 East I turn north riding through Liberty Park. I continue on 600 East to South Temple. My office is just off 600 East and South Temple. I have enjoyed the new Parley’s Trail more than I expected, and love the connection to the S-Line Greenway. Although I didn’t mind the previous route down 2700 South, I enjoy the trail much better. The surface on 2700 South is not great and the traffic can be heavy. There are a couple of minor inconveniences with the route I take. On 600 East the crossing at 800 South can require a long wait for a break in traffic. The warning signals don’t activate unless a pedestrian on the corner pushes a button. As 600 East is a lightly travelled road, the signals between 400 South and South Temple can take longer than average to cycle to green. However, recent crossing upgrades at 900 South, 1300 South, and 2100 South are very nice. C.U. : Why do you commute by bike? K.G. : I commute by bike primarily because it helps me feel good about myself. Cycling to work has great health benefits both physically and mentally. I can achieve some of these benefits by taking transit (driving can be stressful). However my 9-mile ride is faster than taking transit though not faster than driving. C.U. : How often do you commute by bike? What keeps you off the bike to get to work? K.G. : I have only been commuting for about a year and a half. I typically ride about three days a week. It difficult to ride every day as I sometimes have the need for a car at the office for business related travel. I stopped riding in November last year and started back up again in February. It can be fairly windy and extra cold near the mouth of Parley’s Canyon where I depart in the morning. When it drops below about 40 to 45 degrees in the morning, I typically tap out unless it is a day where I can wait until later in the day to start my ride. I have not yet invested in the bike or personal gear needed to be comfortable on these cold winter mornings. I don’t believe Parley’s trail receives any winter maintenance. I know there are facilities around the country that are maintained year-round. I would be interested to see how many cyclists here in Salt Lake City would take advantage of a year-round facility. I know there are many who commute on bike in the winter but I have not made that leap yet. C.U. : Now that you have had about 1.5 years of seeing the completion of your work as you ride the S-line trail, what do you think? K.G. : Overall the project has met our vision. As landscapes grow and change over time it has been fun to see the plant materials mature and grow into the long term vision and experience we had in mind. C.U. : I’m impressed with how nice the landscape has been kept. Who maintains the S-line? K.G. : Salt Lake City and South Salt Lake, as I understand it, are overseeing the ongoing maintenance of the project. City staff, and at times, volunteers work to maintain the trail and greenway. The Utah Transit Authority ensures the streetcar line is maintained to safety standards. C.U. : What are your overall thoughts about separated bike trails like the S-Line trail or redesigning roads to accommodate bikes? K.G. : I believe there should be a range of options provided in all modes of transportation. Everyone should have reasonable access to the modes that work best for them. I say this because our roads, especially local roads, are paid for by a variety of funding sources and shouldn’t be (in most cases) designed for single mode use. Separated multi-use paths and trails are part of the overall system, and I would like to see investment in these facilities as well. These facilities are used for commuting but also for recreational activities. This all adds to the richness of our community. C.U. : Thanks Kelly. Perhaps we will see more pedestrian/bike facilities developed in the style developed by CRSA.